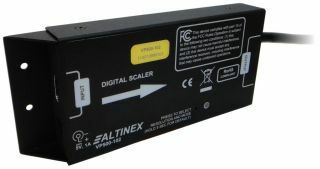 The What: Altinex, manufacturer of Signal Management Solutions, has introduced the VP500-102 Universal Digital Scaler. The new VP500-102 is the ideal solution for scaling HDMI sources—HDTV or PC resolution—to an alternative HDMI resolution (HDTV or PC). As a device that is fully HDMI and HDCP (High-bandwidth Digital Content Protection) compliant, the new VP500-102 is perfect for the incorporation of sources where resolution and/or resolution type requires conversion. A simple on-screen display (OSD) enables the user to configure the device with simplicity—making this an ideal tool that technology / AV managers at conference centers, hotels, and in the education market won’t want to be without. The What Else: The new Altinex VP500-102 Universal Digital Scaler can be used to convert and integrate HD resolution output to PC systems, convert and integrate PC resolution output to HD systems, downscale full HD (1080p) resolution output for HD-ready displays, as well as scale 24 fps Blu-ray input to standard 1080p signal. A typical application for the VP500-102 would be to feed the HDMI output of a source device such as a PC laptop/desktop computer or DVD player and optimize the signal for display on an HDTV display/monitor at 1080p. The Altinex VP500-102 measures just 6 inches by 2.7 inches by 0.9 inch, making it a compact AV solution that can readily hide behind the video display. The unit will upscale the video signal from an HDMI source up to 1080p @ 50/60 Hz and it accepts a wide range of input resolutions, encompassing 480i to 1080p (HDTV) and VGA to WUXGA (PC). Equally notable, the VP500-102 supports audio sampling rates up to 192 kHz, ensuring a superior listening experience to accompany a high quality picture. The How: To provide optimum picture quality, the VP500-102 incorporates a motion adaptive 3D deinterlacing algorithm. This ensures that legacy format video signals of two sub-fields taken in sequence, each sequentially scanned at odd and even lines of the image sensor can be combined into a single frame as is inherent in the latest generation displays. In addition, 3D noise reduction in both the temporal and spatial domains further enhances audio quality. With support for frame rate conversion, adaptive contrast enhancement, native output resolution, and HDMI CEC bypass, the Altinex VP500-102 makes the process of interfacing older generation equipment with new technology easy and intuitive.